The ukulele (/juːkəˈleɪli/ yoo-kuh-LAY-lee; from Hawaiian: ʻukulele [ˈʔukuˈlɛlɛ] OO-koo-LEH-leh; variant: ukelele) is a member of the guitar family of instruments. It generally employs four nylon or gut strings or four courses of strings. Some strings may be paired in courses, giving the instrument a total of six or eight strings. Kamaka Ukulele or just Kamaka is a family-owned Hawaii-based maker of ukuleles, founded in 1916, that is often credited with producing some of the world's finest ukuleles, and created the first pineapple ukulele. British singer and comedian George Formby was a ukulele player, though he often played a banjolele, a hybrid instrument consisting of an extended ukulele neck with a banjo resonator body. Demand surged in the new century because of its relative simplicity and portability. Another British ukulele player was Tony Award winner Tessie O'Shea, who appeared in numerous movies and stage shows, and was twice on The Ed Sullivan Show, including the night The Beatles debuted in 1964. The Ukulele Orchestra of Great Britain tours globally, and the George Formby Society, established in 1961, continues to hold regular conventions. From the late 1940s to the late 1960s, plastics manufacturer Mario Maccaferri turned out about 9 million inexpensive ukuleles. The ukulele continued to be popular, appearing on many jazz songs throughout the 1950s, 1960s, and 1970s. Much of the instrument's popularity (particularly the baritone size) was cultivated via The Arthur Godfrey Show on television. Singer-musician Tiny Tim became closely associated with the instrument after playing it on his 1968 hit "Tiptoe Through the Tulips". All-time best selling Hawaiian musician Israel Kamakawiwo'ole helped re-popularise the instrument, in particular with his 1993 reggae-rhythmed medley of "Over the Rainbow" and "What a Wonderful World," used in films, television programs, and commercials. The song reached no. 12 on Billboard's Hot Digital Tracks chart the week of January 31, 2004. The creation of YouTube was a large influence on the popularity of the ukulele. One of the first videos to go viral was Jake Shimabukuro's ukulele rendition of George Harrison's "While My Guitar Gently Weeps" on YouTube. The video quickly went viral, and as of April 2019, had received over 16 million views. These instruments usually have four strings; some strings may be paired in courses, giving the instrument a total of six or eight strings (primarily for greater strumming volume.) The strings themselves were originally made of catgut. Modern ukuleles use nylon polymer strings, with many variations in the material, such as fluorocarbon, aluminium (as winding on lower pitched strings), and Nylgut. Common types of ukuleles include soprano (standard ukulele), concert, tenor, and baritone. Less common are the sopranino (also called piccolo, bambino, or "pocket uke"), bass, and contrabass ukuleles. The soprano, often called "standard" in Hawaii, is the second-smallest and was the original size. The concert size was developed in the 1920s as an enhanced soprano, slightly larger and louder with a deeper tone. Shortly thereafter, the tenor was created, having more volume and deeper bass tone. The baritone (resembling a smaller tenor guitar) was created in the 1940s, and the contrabass and bass are recent innovations (2010 and 2014, respectively). Note that range varies with the tuning and size of the instruments. The examples shown in the chart reflect the range of each instrument from the lowest standard tuning, to the highest fret in the highest standard tuning. "My dog has fleas" tuning. 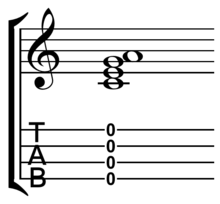 One of the most common tunings for the standard or soprano ukulele is C6 tuning: G4–C4–E4–A4, which is often remembered by the notes in the "My dog has fleas" jingle (see sidebar). The G string is tuned an octave higher than might be expected. This is known as a "reentrant tuning"; it enables uniquely close-harmony chording. A few players prefer "low G" tuning, with the G in sequence an octave lower: G3–C4–E4–A4, which is equivalent to playing the top 4 strings (DGBE) of a guitar with a capo on the 5th fret. Another common tuning for the soprano ukulele is the higher string-tension D6 tuning (or simply D tuning), A4–D4–F♯4–B4, one step higher than the G4–C4–E4–A4 tuning. Once considered standard, this tuning was commonly used during the Hawaiian music boom of the early 20th century, and is often seen in sheet music from this period, as well as in many method books through the 1980s. D6 tuning is said by some to bring out a sweeter tone in some ukuleles, generally smaller ones. D6 tuning with a low fourth string, A3–D4–F♯4–B4, is sometimes called "Canadian tuning" after its use in the Canadian school system, mostly on concert or tenor ukuleles, and extensive use by James Hill and J. Chalmers Doane. Whether C6 or D6 tuning should be the "standard" tuning is a matter of long and ongoing debate. There are historic and popular ukulele methods that have used each. The "higher pitched" instruments (sopranino, soprano, concert) most often employ reentrant tuning, while the "lower pitched" instruments (baritone, bass, and often tenor) usually employ linear tuning, where the strings are tuned from low to high pitch across the instrument. For example, baritone is usually tuned to D3–G3–B3–E4 (like the highest four strings of a standard 6-string guitar). There are, however, exceptions, with some players preferring to place the tenor (and even, rarely, the baritone) into re-entrant tuning as well. One of the main tuning differences between a baritone ukulele and any other ukulele is that the G string is tuned down an octave. The baritone resembles more of a guitar tuning than any other ukulele. It is also common to see electric ukuleles tuned this way (even if they are not a baritone). Hawaiian ukuleles may also be tuned to open tunings, similar to the Hawaiian slack key style. Ukulele can be tuned like Dotara as well (a four string instrument played by the folk singers in India and Bangladesh) Ukulele can be tuned like Dotara in many patterns, but E-B-E-A is the easiest way to tune it as there are only two strings that need to be re-tuned. Ukulele varieties include hybrid instruments such as the guitalele (also called guitarlele), banjo ukulele (also called banjolele), harp ukulele, lap steel ukulele, and the ukelin. It is very common to find Ukulele's mixed with other stringed instruments because of the amount of strings and the easy playing ability. There is an electrically amplified version, the electric ukulele. The resonator ukulele produces sound by one or more spun aluminum cones (resonators) instead of the wooden soundboard, giving it a distinct and louder tone. The Tahitian ukulele, another variant, is usually carved from a single piece of wood, and does not have a hollow soundbox. Close cousins of the ukulele include the Portuguese forerunners, the cavaquinho (also commonly known as machete or braguinha) and the slightly larger rajão. Other relatives include, the Venezuelan cuatro, the Colombian tiple, the timple of the Canary Islands, the Spanish vihuela, the Mexican requinto jarocho, and the Andean charango traditionally made of an armadillo shell. In Indonesia, a similar Portuguese-inspired instrument is the kroncong. ^ Erich M. von Hornbostel & Curt Sachs, "Classification of Musical Instruments: Translated from the Original German by Anthony Baines and Klaus P. Wachsmann." The Galpin Society Journal 14, 1961: 3–29. ^ "Ukulele". Merriam-Webster. Retrieved 22 January 2016. ^ a b Tranquada and King (2012). The Ukulele, A History. Hawaii University Press. ISBN 978-0-8248-3634-4. ^ Catalogue of the Crosby Brown Collection of Musical Instruments of All Nations. Volume III. Instruments of Savage Tribes and Semi-Civilized Peoples, Part 2. Oceania. New York: Metropolitan Museum of Art. 1907. p. 51. ^ "David Kalakaua (1836–1891), Inaugural Hall of Fame Inductee, 1997". Ukulele Hall of Fame Museum. 2008. Retrieved 2008-06-11. ^ Karr, Gary, and McMillan, Barclay (1992). "J. Chalmers Doane". Encyclopedia of Music in Canada. University of Toronto Press. Retrieved 2008-06-09. ^ Beloff, Jim (2003). The Ukulele: A Visual History. Backbeat books. p. 110. ISBN 978-0-87930-758-5. ^ Fladmark, Judy (2010-02-19). "Ukulele sends UK crazy". BBC News. ^ Tranquada, Jim (2012). The Ukulele: a History. University of Hawaii Press. p. 152. ISBN 978-0-8248-3544-6. ^ Lipsky, William (2005). San Francisco's Panama-Pacific International Exposition. Arcadia Publishing. p. 36. ISBN 978-0-7385-3009-3. ^ Doyle, Peter (2005). Echo and Reverb: Fabricating Space in Popular Music Recording, 1900–1960. Wesleyan. p. 120. ISBN 978-0-8195-6794-9. ^ "Jonah Kumalae (1875–1940), 2002 Hall of Fame Inductee". Ukulele Hall of Fame Museum. 2007. Retrieved 2008-06-02. ^ Koskoff, Ellen (2005). Music Cultures in the United States: An Introduction. Routledge. p. 129. ISBN 978-0-415-96588-0. ^ Volk, Andy (2003). Lap Steel Guitar. Centerstream Publications. p. 6. ISBN 978-1-57424-134-1. ^ Whitcomb, Ian (2000). Ukulele Heaven: Songs from the Golden Age of the Ukulele. Mel Bay Publications. p. 11. ISBN 978-0-7866-4951-8. ^ a b Whitcomb, Ian (2001). Uke Ballads: A Treasury of Twenty-five Love Songs Old and New. Mel Bay Publications. p. 4. ISBN 978-0-7866-1360-1. ^ Sanjek, Russell (1988). 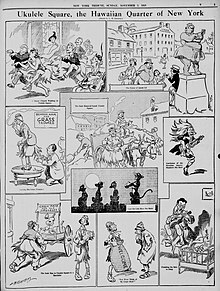 American Popular Music and Its Business: The First Four Hundred Years. Oxford University Press. p. 95. ISBN 0-19-504311-1. ^ a b Rev, Lil'. ""Just a few penny dreadfuls": the Ukulele and Old-Time Country Music". www.oldtimeherald.org. Retrieved 2018-06-27. ^ Wright, Michael. "Maccaferri History: The Guitars of Mario Maccaferri". Vintage Guitar. Archived from the original on 2009-06-25. Retrieved 2008-06-02. ^ "Arthur Godfrey (1903–1983), 2001 Hall of Fame Inductee". Ukulele Hall of Fame Museum. 2007. Retrieved 2008-06-02. ^ John Shepherd (27 February 2003). Continuum encyclopedia of popular music of the world: VolumeII: Performance and production. Continuum International Publishing Group. pp. 450–. ISBN 978-0-8264-6322-7. Retrieved 16 April 2011. ^ Billboard, for the survey week ending January 18, 2004. ^ cromulantman (22 April 2006). "Ukulele weeps by Jake Shimabukuro". Retrieved 3 April 2019 – via YouTube. ^ "Ukulele Strings - C.F. Martin & Co". Retrieved 30 November 2016. ^ "Aquila Nylgut Ukulele Strings, wholesale source for retailers and dealers". Retrieved 30 November 2016. ^ "110mb.com - Want to start a website?". Archived from the original on 2013-06-21. Retrieved 30 November 2016. ^ "Kamaka Baritone 8 String HF-48". Retrieved 30 November 2016. ^ "Kala -KA-ATP-CTG Solid Cedar Top Tenor Slothead -Gloss Finish". Retrieved 30 November 2016. ^ "Lamorinda Music". Retrieved 30 November 2016. ^ "The story behind the wildly popular Kala U-Bass". 7 January 2015. Retrieved 30 November 2016. ^ "Uke Baritone Bass w/Preamp Tattoo - Luna Guitars". Retrieved 30 November 2016. ^ The “scale” is the length of the playable part of the strings, from the nut at the top to the bridge at the bottom. ^ Exact range depends on the tuning and the number of frets. ^ On the soprano, concert, and tenor instruments, the most common tuning results in a "bottom" string that is not the lowest in pitch, as it is tuned a 5th higher than the next string (and a major 2nd below the "top" string). This is called re-entrant tuning. ^ a b c d e "Ukulele/Banjouke". 2 January 2014. Retrieved 30 November 2016. ^ Tenor ukuleles exist in a variety of styles, with 4, 5, 6, and 8 strings. What the tenor is called depends on which style it has been designed in. ^ "Ukulele in the Classroom". Retrieved 30 November 2016. ^ "James Hill - FAQ". Retrieved 30 November 2016. ^ Tranquada, J.; The Ukulele: A History; University of Hawaii Press; Honolulu: 2012. 0824-83634-0 According to Tranquanda, ""This is an old and seemingly never-ending argument. While the pioneering methods of Kaai (1906) and Rollinson (1909) both use C tuning, a sampling of the methods that follow give a sense of the unresolved nature of the debate: Kealakai (1914), D tuning; Bailey (1914), C tuning; Kia (1914), D tuning; Kamiki (1916), D tuning; Guckert (1917), C tuning; Stumpf (1917), D tuning." ^ Kimura, Heeday. How to Play Slack Key Ukulule. ^ Ovi, Rahatul Islam (24 April 2017). "Ukulele Dotara Style Tuning - ইউকালেলি দোতারা স্টাইল টিউনিং". Rahatul & Dukulele. Retrieved 24 April 2017 – via YouTube. ^ University of the South Pacific. Institute of Pacific Studies (2003). Cook Islands culture. Institute of Pacific Studies in Association with the Cook Islands Extension Centre, University of the South Pacific, the Cook Islands Cultural and Historic Places Trust, and the Ministry of Cultural Development. ISBN 978-982-02-0348-8. Retrieved 15 September 2012. ^ Jeremy Wallach (22 October 2008). Modern Noise, Fluid Genres: Popular Music in Indonesia, 1997–2001. Univ of Wisconsin Press. pp. 268–. ISBN 978-0-299-22904-7. Retrieved 15 September 2012. Beloff (2003) . The Ukulele: A Visual History (Revised & Expanded ed.). San Francisco: Backbeat Books. ISBN 0-87930-758-7. Tranquada, Jim; King, John (2012). The Ukulele: A History. Honolulu, Hawaii: University of Hawaii Press. ISBN 978-0-8248-3634-4. "Bass Ukulele utilizing Ashbory strings". largesound.com. "The Ukulele & You". Museum of Making Music. Carlsbad, CA. An exhibition that details the ukulele's history and waves of mainstream popularity. "Ukulele Brand name database". Tiki King. Information about over 600 ukulele makers past and present.